Our great promotion has finally come to an end. You have only last two days to take part in it, if you didnt create your Partypoker account yet - only accounts that are created and have deposited until end of tomorrow (Sunday, 9.9.2018) will be eglible. Every of those accounts registered at PartyPoker with LiquidPoker will get a special boost. 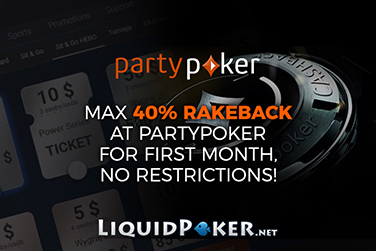 With this promotion you can get maximum rakeback (40% from software) on PartyPoker LiquidPoker for a full month after you create your account, no matter how much you rake! With this, all new accounts will get at least 52.5% rakeback for the first month (40% from software + 12.5% from first deposit bonus and MORE from our free Playstation 4 promo). If you were looking for time to move to PartyPoker, it's now. Every LiquidPoker player who activates their account after that (thus makes a deposit) and ticks the opt-in box for rakeback at PartyPoker, is going to receive 40% (MAXIMUM possible) rakeback for a month, no matter how much rake he makes. Yes, no minimum limit - even if you rake 1$, you will receive 40% rakeback. The second installment of rakeback (for a total of 40%) over the reguraly earned amount will be send directly to your account few days after you receive the regular one. After the special period is over players will go back to standard type of counting rakeback. You can still get 40% RB weekly if you collect enough points, though. And of course - extra rakeback and free PlayStation 4 from LiquidPoker private offer - they all add up. Check the great rakeback programme that PartyPoker and LiquidPoker has to offer: Special private LiquidPoker rakeback offer for PartyPoker. The special 40% rakeback offer works TOGETHER with our private offer from the link above!